This question feeds to a larger one which lies at the heart of the Beyond the Spectacle project, which is to question where to find evidence for the historical relationships between Native North Americans and the British public in Britain itself. Funded by the AHRC and jointly administered by the Universities of Kent and East Anglia, Beyond the Spectacle assembles a team of scholars from literary and cultural studies, history and anthropology, to uncover the hidden stories of Native travellers to Britain and through a series of collaborative programmes to draw direct connections between these histories and contemporary Native North American visitors to this country. During their visit to the British Museum, the Warriors sought to connect with these ancestors by engaging with the objects they had left behind, but found themselves disappointed with how little remained. The discussion was not one of repatriation, but of knowledge, questioning why so little was publicly known, why so little was publicly accessible for the Cherokee on this seminal moment in the history of the British and the Cherokee. This is a problem with which Beyond the Spectacle has grappled throughout its year and a half in existence. Native North American visitors are not uncommon in the historical record – initial searches revealed hundreds of encounters in the historical archives, from diplomats like Ostenaco (and of course Pocahontas a century before); entertainers such as the Ojibwe showmen of the 1840s who performed at Windsor Castle, the Mohawk lacrosse teams who toured Britain in the 1870s and 1880s and Buffalo Bill’s famous Wild West Sioux ofthe 1880s-1900s; soldiers such as the Canadian volunteers of the First and Second World Wars ; and modern visitors like the AIM activists who toured Ireland and Wales inthe 1970s, artists who ran shows at venues like Bristol’s own Rainmaker Gallery and modern groups who combine a little of all of these categories, such as the Warriors of Anikithua. Together these groups have made thousands of public appearances before hundreds of thousands of British people, and collectively have generated an understanding, partial and incomplete but largely positive, of what it means to be Native North American among the British public. This understanding, this engagement between the colonial and colonised, between the former Imperial centre and its periphery, has lasting effects in awareness, in law, and in popular and academic collaboration, all of which Beyond the Spectacle seeks to probe. · To promote dialogue through residencies of Native artists – last summer Laguna Pueblo artist Marla Allison completed amonth-long residency in Bristol at Rainmaker, and this summer of 2019 Kwakwaka’wakw artist Sonny Assu will undertake one in Norwich, at least two more are in the works. 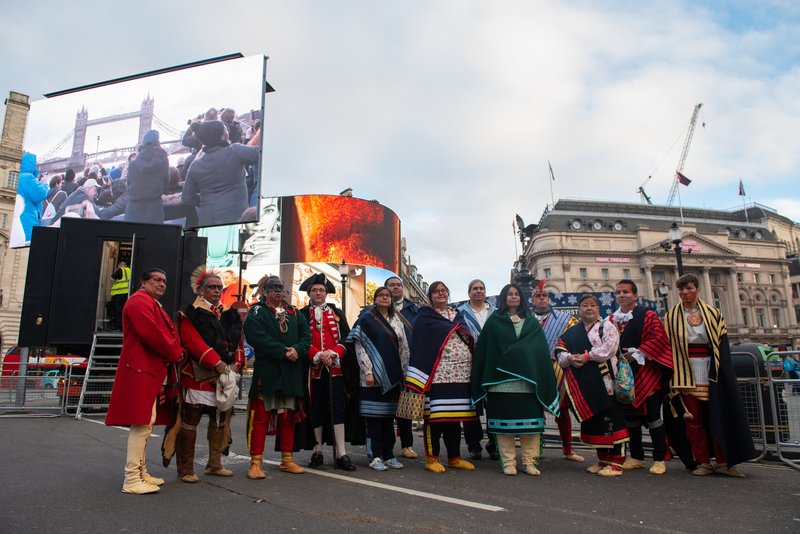 · To raise prominence of Native American histories in the UK through events and installations, such as our involvement in the coming re-erection of the Salford totem pole. · To develop an archive for future research, combining summaries of historical and press archives pertaining to Native North American visitors with an extensive series of interviews with contemporaryNative visitors, such as the actor Eugene Brave Rock, the artist Sierra Tasi Baker and numerous private students, tourists and scholars who have given their time to the project. This will enable those who follow in our footsteps to make best use of the vast body of data we are still assembling. · To promote scholarship through published worksand academic symposia, including one in 2018 hosted by the University of Bristol,another this coming summer at East Anglia and future events in Canterbury andParis. · To further public education, both through formal teaching resources using material from our research to educate school children on Native American history and contemporary ways of life, as well as locally-focused walking tours and historical references for non-academic audiences to enable people to better understand their own personal, local history with Native North Americans. 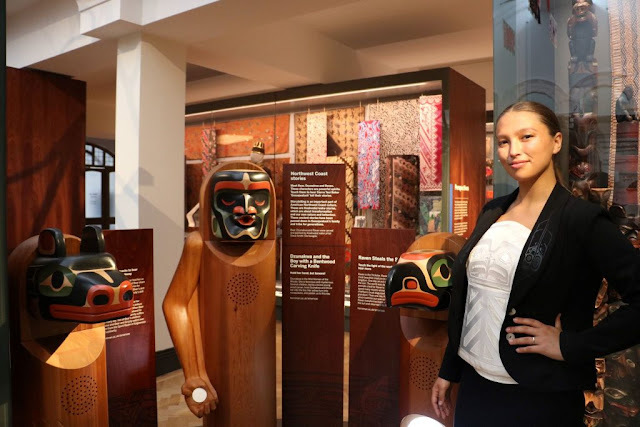 · To enable more Native visitors to travel to Britain, through specific grants, such as the Canada Council grant obtained for Kwakwaka’wakw artist Sierra Tasi Baker to attend the opening of an exhibit at the Horniman museum to which she contributed (image below). Or more generally though improving access, to enable both visiting Native Americans and the broader British public to better access not only the archives and the sites of history, but the material evidence left behind. Sierra Tasi Baker and the Kwakwaka’wakw interactive at the Horniman Museum, June 2018. Image courtesy of Skyspirit Consulting. Though Beyond the Spectacle works as a team on all aspects of this project, one of my own personal ambitions is to promote better knowledge and access to museum collections; Native North American holdings in museums in the UK are enormous and, as many were formed at the first point of contact, hold immense significance for Native American visitors. Though of course the British Museum’s collections are huge and available online, much of this material is held in smaller regional collections too-often unknown to Native visitors. To this end we are slowly building an online guide toprominent Native collections in the UK, starting last year with the South-East and building in time to cover the whole country. In time, this resource should help all visitors, but in particular Native American visitors, to better access and engage with historic collections, and to help answer the question of where everything, where the material evidence of this long and complex history, has found a home.